The following was written in the 19th century by a William Henry Channing. To live content with small means, to seek elegance rather than luxury, and refinement rather than fashion, to be worthy not respectable, and wealthy, not rich, to study hard, think quietly, talk gently, act frankly, to listen to stars and birds, babes and sages, with open heart, to bear all cheerfully, do all bravely, await occasions, hurry never – in a word, to let the spiritual, unbidden and unconscious, grow up through the common. This is to be my symphony. I’ve loved this ever since I discovered it perhaps 10 years ago. I love “hurry never”. I love it because in today’s world it seems to be hurry always. Hurry is not a natural way to be. It is not a natural state for us. It implies that we have to get what we are doing now done quickly to get on to the next, more important thing. And so our lives are an endless rushing through the unimportant to get to the important. For me, Orvieto inevitably stops any hurrying in life. 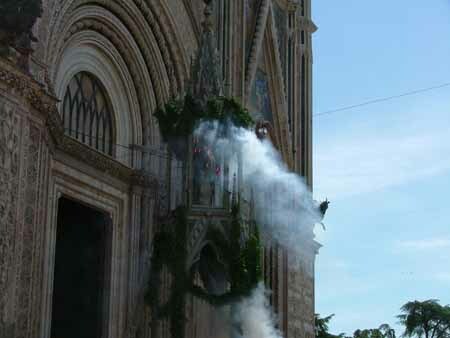 Orvieto has, over the last 8 years, led me to stop hurrying nearly always. How has it done this, and how does it do it for those who travel with us? By putting us in an environment so rich in character and detail that all our senses come alive to appreciate it. The human-scaled, medieval village engages every sense. As a result we get out of our mind thinking about what we must hurry toward next to live in the richness of everything around us. Because we have no TV, little Internet, cell phones that don’t work in Italy, a 6 hour time difference with home, we allow ourselves to disconnect from all the to-dos, shoulds, deadlines, and all the bad news foisted on us by the media. Since the Italians, while busy, take so much time for and pay so much attention to each other, particularly over meals, you can’t help but be impressed and recognize how little you do the same. Orvieto has profoundly influenced me to slow down. Clearly, I was ready for it, felt drained by the pace Americans keep, and wanted a saner, richer life. But Orvieto enabled me to appreciate life by slowing down, to see the benefits of a slower pace, to experience the joy that exists when you are in the present moment. Imagine what our lives would be like if we hurried never! I have obviously been terrible about posting here these past few months. Our move to North Carolina has eaten up great gobs of time as we work to get our house in shape. But we are loving it. We leave soon for Italy with several wonderful groups. 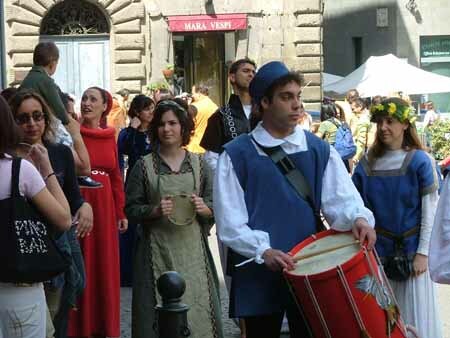 Happily, this trip coincides with some great events in Orvieto. 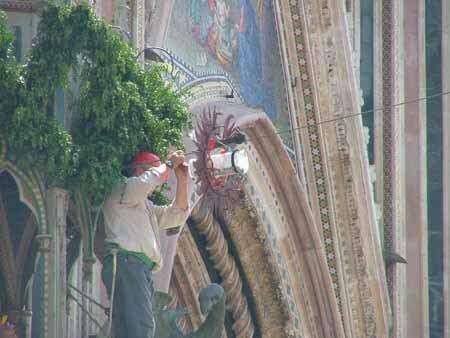 Palombella is held at Pentecost and will take place May 23rd. 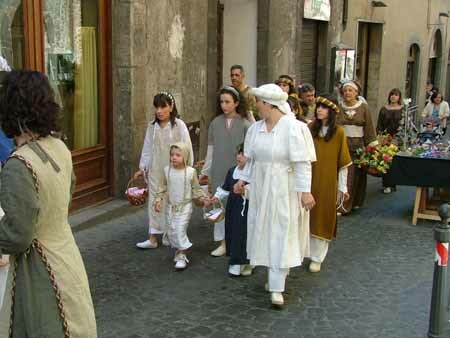 Then, beginning May 29, there will be a week-long celebration of Corpus Domini. 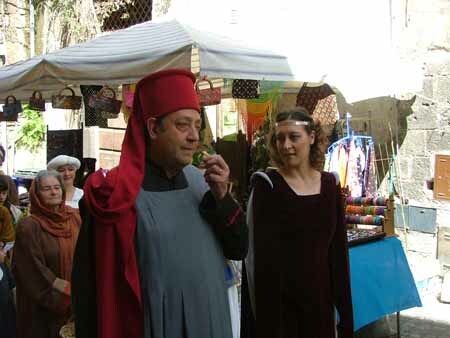 Through it all there will be parades of folks in medieval costumes, special dinners, food and medieval fairs, and much more. It is a sheer delight. We have not yet been to Corpus Domini. This will be our first time and we are excited to see how the town responds and decks itself out. The pictures here are from Palombella held a couple years ago. During the celebration a pigeon is placed in a cage that slides from a church tower to a specially built structure housing numerous saints. When the pigeon arrives at the structure the saints’ heads light up. The pigeon is given to the first couple married in the church this year. Their job is to take special care of the pigeon. One of our favorite restaurants in Orvieto is Palomba or pigeon. They have pigeon on the menu as do other restaurants. It is quite tasty!